In November “Take a Bite Out of Pain: A Journey to Overcoming Temporomandibular Joint Dysfunction (TMD)” was released and available for purchase. 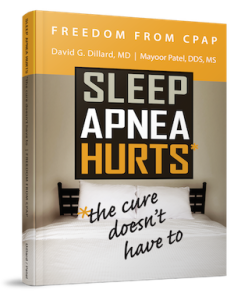 It is exciting to have both a book on TMD and sleep apnea for further outreach and education on topics that are often overlooked. This new educational book serves many purposes. It can be put on display at your office for your patients or it can be gifted to a friend or family member that might be suffering from pain. This educational book is now available for purchase at Lulu.com, Amazon and Barnes & Noble. Pick your favorite website to go to and purchase it! I wrote this book in collaboration with Sara Berg, my writer. As many of you know, she has been writing for me for almost five years now and this is our second book together. We decided to write about pain and TMD to better educate patients on these symptoms and what to do. As dentists, we are in a unique position to help our patients feel better, so why not continue to provide them with the resources they need to better understand their condition? “Pain should never be ignored. Whether it is pain in your jaw, or what seems like a headache, don’t ignore the discomfort. Ignoring pain would be a waste of time, leading to further complications with your health. Search for the underlying cause of your pain with help from qualified dentists that treat such cases. Finding the source of your nagging pain will help you continue on with your daily activities—hopefully eliminating any discomfort present. Don’t just “put up with” pain—seek proper treatment. Pain is a complex and complicated symptom tuned by your brain, as it triggers every painful sensation. Are you just going to sit there and wish the pain away? No, absolutely not. I look forward to hearing your thoughts and I hope that you utilize this book to help your patients before, during or after their visits to your dental office!